Car community has managed to see a new generation of Porsche 911, but the Germans had just decided to test the GT3 in the field. This is how ubiquitous spies, the paparazzi have noticed the car while it was tested in the snowy conditions. And, as becomes clear from these pictures, the car was typical of the GT3 bumper, located in the center of the double connections, but so far from the wing had to be abandoned. And yet it remains unknown what engine will use this model, but it certainly can be said that the power to make about 450 horsepower. 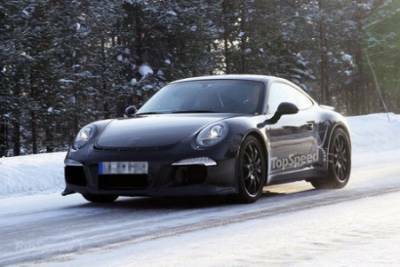 As previously reported, the new Porsche GT3 will get PDK gearbox and the electric drive steering.